On Friday 28 September, a deadly earthquake struck the Indonesian island of Sulawesi, which then triggered a tsunami. Waves, more than three metres high, swept across the land destroying almost everything in their wake. The tsunami tore up roads, washed away homes and cut off lines of communication. All We Can has been working in the region through its trusted humanitarian partners to deliver life-saving food, shelter and sanitation items. 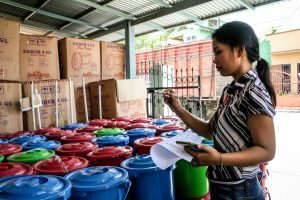 Staff from All We Can’s partner in Indonesia count the hygiene kits before distribution in Palu. 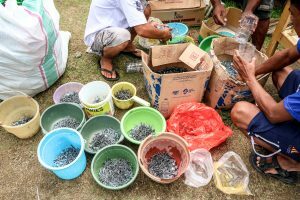 Staff prepare nails and other items to be included in the shelter kits for distribution in Panau, Palu city. 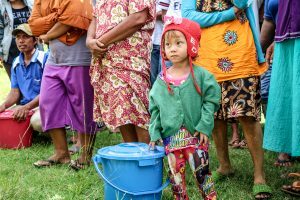 This picture shows little Ilani after receiving a hygiene kit in Simoro village, Sigi. The 28 September earthquake destroyed or damaged most of the houses in the village. 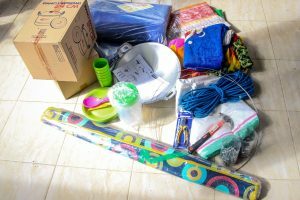 Items included in the emergency shelter kit include two tarpaulins, two blankets, two mosquito nets, ropes, wires, nails, a hammer, a mattress and a kitchen set.